If you don’t already have tickets, please note that the website says they are sold out — however, they also have a waiting list for unsold tickets and cancellations. Click here for more information. It’s Tapa Hop time! Fort Myers Beach’s yearly pub crawl features trolley transportation to six great area restaurants, each providing appetizer items or ‘tapas’ included in the price for the event. The event will also include raffle prizes, grand prizes and a poker run. Don’t miss out on the fun! Come on down to Old San Carlos Blvd on Fort Myers Beach to enjoy tasty samples from local area restaurants as well as great live entertainment at the Taste of the Beach! 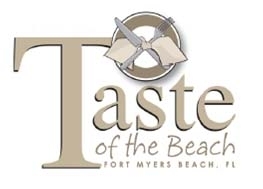 The 18th Annual Taste of the Beach will be held Sunday April 28, 2013. More than 20 restaurants will participate along with live on-stage concerts by country rock recording artists Craig Campbell, Brett Eldredge and the Grayson Rogers Band. Gator Country 101.9 and Island Food Group are sponsoring the live music stage from 11:00 a.m. until 7:00 p.m.
$5 for adults and children over 12. Children under 12 are free. Food tickets will be $1.00 each, with a $5 average food serving price. hoice Award will be done by the Office of Lee County Supervisor of Elections Sharon L. Harrington. This year’s awards will be announced onstage at 4:00 p.m.
Food tickets are $1 each. 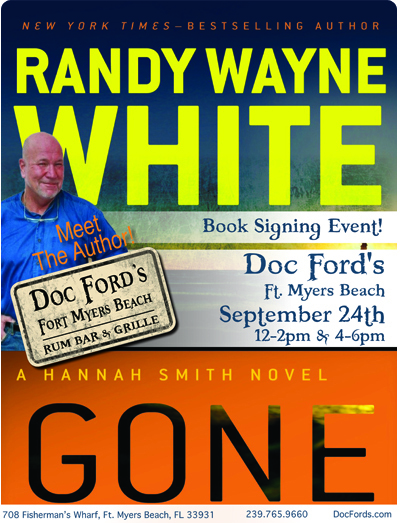 Join Randy Wayne White as he discusses and signs his newest novel, Gone, at Doc Ford’s Rum Bar and Grille in Fort Myers Beach on September 24th, from noon-6pm. Gone features Hannah Smith, descendant of generations of resourceful Florida women with wit, spirit and backbone. A Sanibel fishing boat captain, Hannah didn’t plan to do anything with the investigative agency she inherited, until circumstances conspire to send her off to find a missing heiress. The trail of clues leads her from the enclaves of Captiva’s wealthiest to the mangrove swamps of the Ten Thousand Islands and deep into the recesses of the Florida underbelly never seen by tourists. Set in the world fans have come to love so well from the Doc Ford series, White once again captures the true spirit and essence of the land, its people, and its ecology, with an unforgettable new heroine. Gone is a first-rate mystery from one of the true masters of the genre. Randy Wayne White brings all of his expert knowledge of the locale as well as his years of experience captaining a boat to bear in his writing, and it pays off with an explosive and exciting novel that will please both his legions of current fans and new ones alike. Winner of the Conch Republic Award for literature and the John D. MacDonald Award for Literary Excellence, Randy Wayne White has written 19 Doc Ford novels, four nonfiction books, two cookbooks, and seven novels under the pseudonym Randy Striker. Before becoming a professional writer, he spent 13 years as the captain of a charter fishing boat in Florida’s Tarpon Bay. He lives on Sanibel Island, where he can regularly be found at Doc Ford’s Rum Bar and Grille. Crowds line up for shrimp and … more shrimp! Get your Pink Gulf Shrimp! 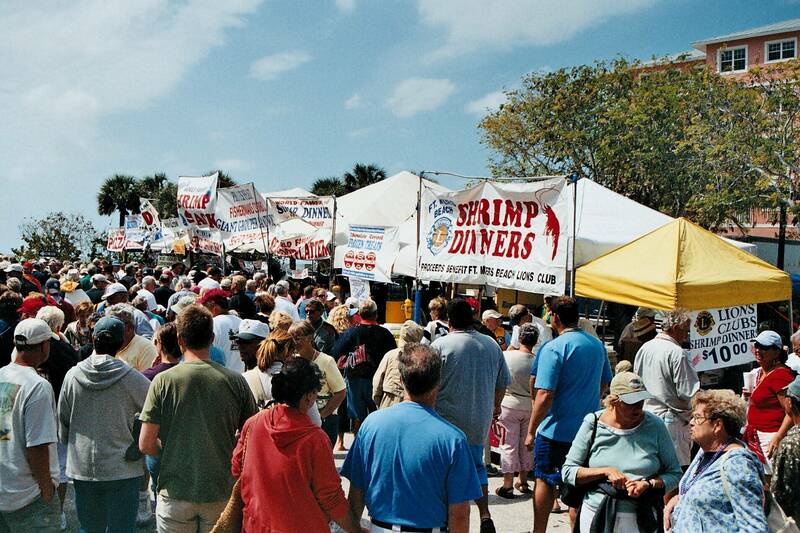 With its humble beginnings as the Blessing of the Shrimp Fleet over 50 years ago, the Ft. Myers Beach Shrimp Festival has become a world famous beach-front celebration of shrimp. Every year since 1959, the Fort Myers Beach Lions have been boiling and serving delicious Gulf Pink Shrimp to lucky festival attendees! The secrets of perfectly cooked ‘peel and eat’ shrimp have been passed from boil-master to boil-master through the years, as well as the secret recipe for Lions delicious cocktail sauce. It all starts, of course, with the finest shrimp the Gulf can offer. Delivered straight from the Fort Myers Beach Shrimp Boat Fleet, the Gulf Pink Shrimp is unsurpassed in flavor and versatility. 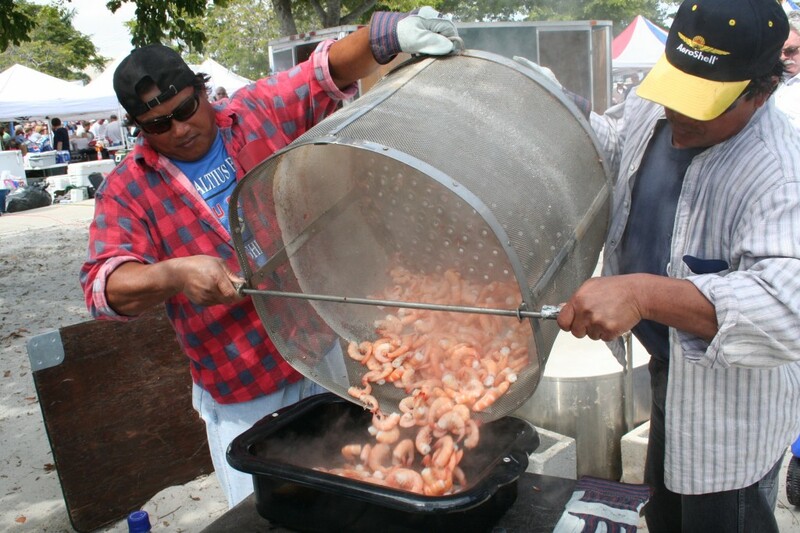 Beach Lions serve over one thousand pounds of the fresh local sweet pink crustaceans every year, making the Shrimp Boil one of the main attractions of this 52nd annual festival. Lions toil and boil for two days, from 10 until six, to bring the goodness of the Gulf directly to the savvy folks in the “Shrimp Line”. Following the two-hour beach parade Saturday morning the line forms for the best and freshest food that southwest Florida has to offer. One half pound of steaming shrimp is served on every plate, accompanied by sauce and slaw. 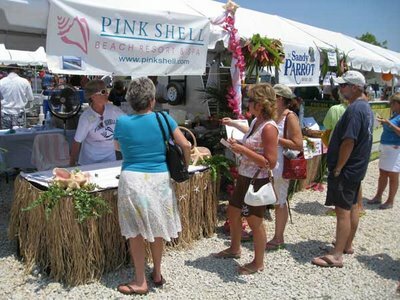 While they are there, Festival goers also take the opportunity to browse and buy from the 100 beach crafters and vendors who have made this event one of the best beach festivals in the South and a mecca for tens of thousands of visitors each year. On the way through the festival there’s usually some music to enjoy, a collectable Official Festival tee shirt, hat or tank top, an opportunity to watch the crowning of the next Shrimp Festival Queen, and a huge selection of other eating and entertainment opportunities. What better way to spend a Saturday or Sunday afternoon than enjoying shrimp at the edge of the Gulf of Mexico and dipping your toes into the sparkling sea too? Many people come both days just for the shrimp boil, which is testament to the goodness dished out by the Fort Myers Beach Lions. A better shrimp dinner cannot be found! While Bubba Gump may be able to cook shrimp in a variety of ways, the Fort Myers Beach Lions excel in the pureness of boiled shrimp. After all, this is the SHRIMP festival! For daily schedule of events and more information click here. This weekend we had lunch at the Fort Myers Beach location of Doc Ford’s Rum Bar and Grille. Inspired by author Randy Wayne White’s novels about a marine biologist named Doc Ford, the restaurant is located on the waterfront, just south of the bridge to Estero Island at Matanzas Pass. The service was efficient, and the food was pretty good too. 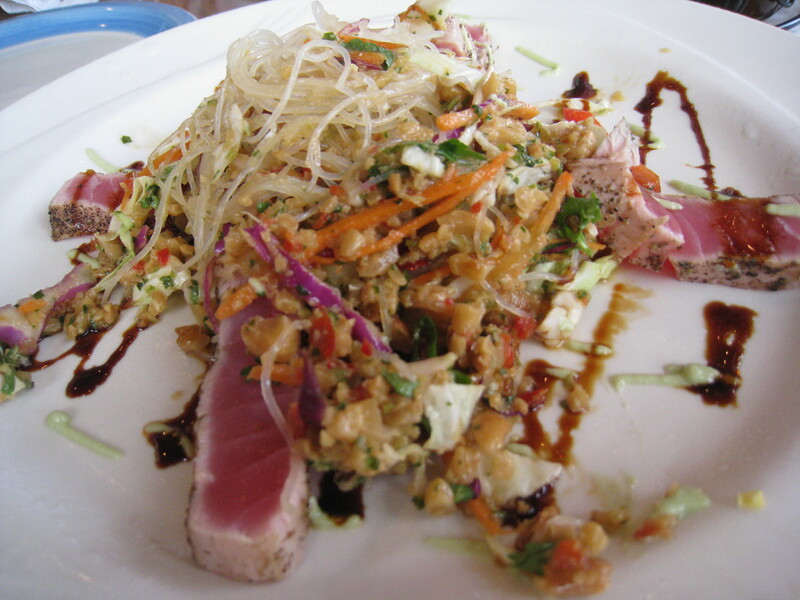 We ordered an Ahi Tuna appetizer ($10.95). The presentation was beautiful and the taste was great, but there definitely could have been more tuna on the plate. Four thin little slices of the fish left us wanting more. For entrees,we ordered a Lime Panko Crusted Fish Sandwich ($9.95), which according to the menu, was voted Best Fish Sandwich. We can see (er, taste) why! Although the bun was soggy, making the sandwich difficult to eat, the fish itself was truly delicious. Also, we ordered our old standby, the Campeche Fish Tacos ($13.95) with yellow rice. As usual, the tacos did not disappoint. Finally, the Grouper Sandwich Grilled ($13.95) with a side of mashed potatoes also earned thumbs up. The fish was very fresh and cooked just right. On your way out, don’t forget to check out the souvenirs at Doc Ford’s, including T-shirts, caps, and of course, White’s books. 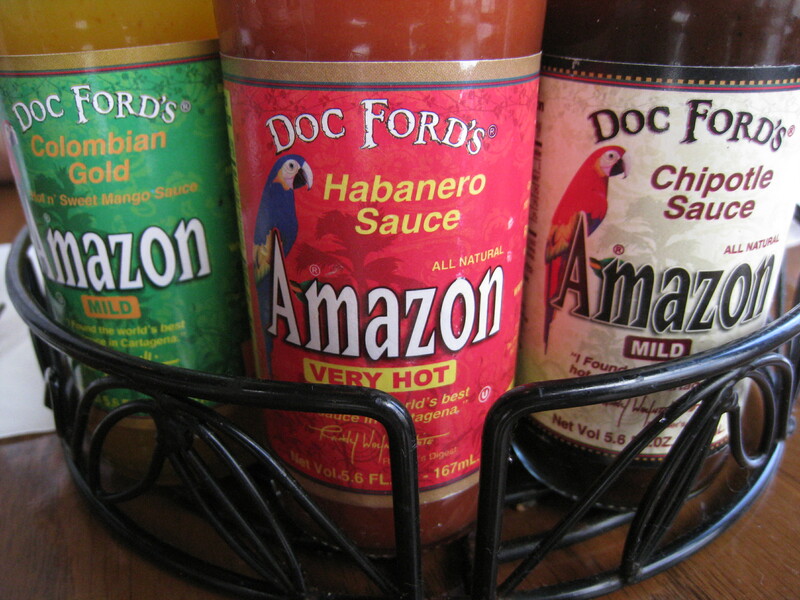 We recommend the bottles of Amazon hot sauce named for the books’ characters. There’s indoor and outdoor seating available, with views of the Gulf, and on some nights, live music on the waterfront.